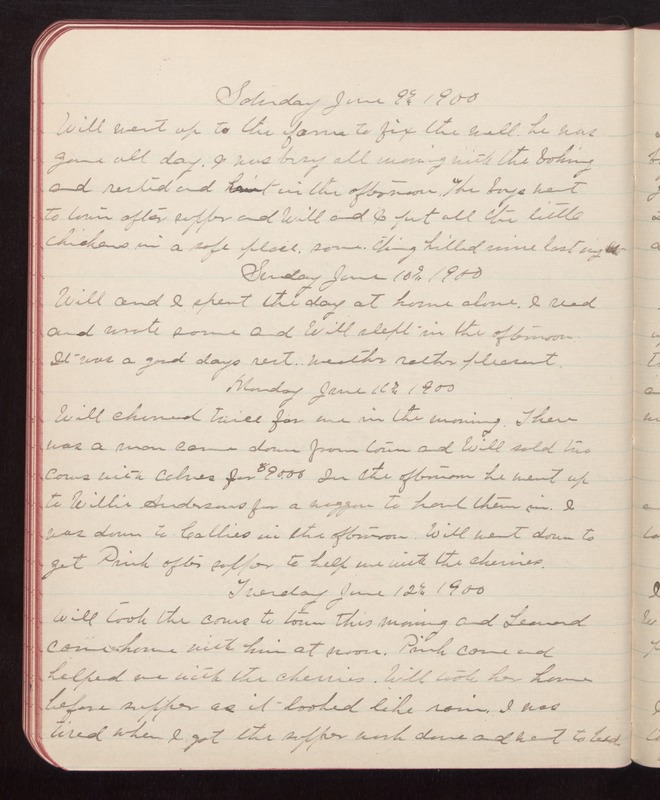 Saturday June 9th 1900 Will went up to the farm to fix the well. he was gone all day. I was busy all morning with the baking and rested and knit in the afternoon. The boys went to town after supper and Will and I put all the little chickens in a safe place. some thing killed nine last night Sunday June 10th 1900 Will and I spent the day at home alone. I read and wrote some and Will slept in the afternoon. It was a good days rest. Weather rather pleasant. Monday June 11th 1900 Will churned twice for me in the morning. There was a man come down from town and Will sold two cows with calves for $90.00 In the afternoon he went up to Willie Andersons for a waggon to haul them in. I was down to Callies in the afternoon. Will went down to get Prish after supper to help me with the cherries. Tuesday June 12th 1900 Will took the cows to town this morning and Leonard came home with him at noon. Prish came and helped me with the cherries. Will took her home before supper as it looked like rain. I was tired when I got the supper work done and went to bed.